Why do I need First Aid or why do I need to train my employees in First Aid? Many people have been faced with the situation; where they come upon a medical emergency or accident at home, at work or on the street and don’t know how to act. A simple procedure such as CAB can save someone’s life. In accordance with the Occupational Health and Safety Act (Act 85 of 1993. ), Regulations 3(1 & 4) of the General Safety Regulations every business (including Government) is required to have their personnel trained in first aid. The Department of Labour are continuously inspecting companies to see that they comply with the Occupational Health and Safety Act. They can fine companies up to R 50 000,00 for non-compliance to the act. What will the student be able to do after completing a course? Prevent accidents through the development of safety-oriented life style. What does the student receive when attending a course? First Aid training of employees could save lives.See the course information sheet for specific durations. Mine / my employee's certificate is about to expire? You or the employee can attend a refresher course that is held on a regular bases or you/ they can attend a higher level course. Mine / My employee's certerficate has expired! What now? Unfortunately our registration and accreditation rules require that the student redo the course in full. All students are required to submit a copy of their certification with their application for all refresher training. Is there a minimum number of students required for a course? “Public” courses are scheduled every month and are held at our training venue; these courses are normally for individuals or small groups. “Closed / In-House” courses can be scheduled by you at a requested date & time at your venue or at a venue arranged by ourselves. Please note that there are terms and conditions applicable and is also subjected to the availability of training staff. In what language are the courses presented? All our courses are presented in English. Should you require the course in another language, this can be arranged however there may be cost involved for a interuptor. What does the cost of a course include? The cost of a course includes all instruction, manuals and notes, an Emergency Key Ring pouch and certificate. On Public & Closed Courses presented at our venue, we will provide only Tea & Coffee, Lunch will be the employers / students responsibility. Travel & Accommodation will be added to quotations, where training takes place away from our registered offices. Do you have a question specific to your situation? 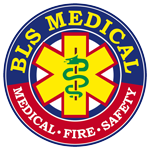 Please add me to BLS Medical's newsletter list.